It’s the start of a new year and everybody is thinking about setting goals and resolutions. As I mentioned in a previous blog instead of resolutions, I like to think of healthy habits that I want to cultivate in the coming year and work out ways to make them happen. I was quite happy with myself when I looked back at that post and realised that I have incorporated most into my daily routine now (although some I could be better at). For 2019 I want to be more aware of my buying and consumption habits. Over the last few months sustainability, zero waste, veganism and minimalism have appeared more and more on my radar especially in relation to the environmental impact of our day-to-day choices and how much waste we are creating. The health of our environment has a huge impact on our health. This year I want to educate myself and adopt more environmentally-friendly habits. I feel like I’ve made a start but there is a lot of room to improve for sure. While there are people living zero waste, going vegan or even embarking on a no-buy year (where they buy nothing other than bare necessities – fair play to them), I’m probably going to take an every-little-bit-helps approach. Single Use Plastic. Plastic sticks around for YEARS. It’s also full of nasty chemicals which can be endocrine (hormone) disruptors. Ditch the plastic water bottles and use my reusable stainless steel water bottle. I’ve got a S’well bottle. I need to get back into filtering water at home and bringing the bottle with me in the morning. Ditch the reusable coffee cups from coffee shops. I’ve got a KeepCup that I should bring with me if I’m getting a take-out coffee or I should sit in and enjoy my coffee/tea in a cup/mug in the café. Another way to use the KeepCup is to make my tea/coffee at home and bring it with me. Ditch the plastic straws and use steel straws instead. I rarely use plastic straws as I rarely get drinks that come with straws when I’m out and about. However, I do drink lemon water in the morning and I want to protect my teeth so using a steel straw will help with this. Also I think it will be good to carry one with me in case I get a juice or smoothie when I’m out and about. Use a reusable canvas grocery bags/totes when I go grocery shopping. Making sure one is in my handbag or car will ensure I have one handy when I go to the supermarket. Choose produce in the supermarket that doesn’t have plastic packaging. I personally like shopping at farmers markets – not only is the produce seasonal, local and organic, it also tends not to have packaging. And it can work out cheaper too. Use what I’ve got rather than throwing it away (e.g. my BPA free lunch boxes). See what can be repurposed – e.g. maybe I could make my own cleaning product and use the spray bottle I already have. Be mindful of cosmetics and skin care product packaging. Are there options I could buy that come in glass bottles? Investigate brands that offer recycling for their (and other brands) products. Shop my wardrobe – use what I have. Alter / mend rather than dispose. If I’m going to buy something, ask myself if will I wear it 30+ times. It will make me more conscious of buying classic pieces that will endure over fast-fashion trends. Buy second hand. I love consignment stores and whenever I’m in the US I will seek them out. Consignment stores here in Ireland tend to be for more designer items but I hope we see a few more stores that aren’t exclusively designer pop up over the coming years. In the meantime, I want to become open to shopping in charity and vintage stores as well as online on various sites like Depop and Ebay. Investigate sustainable fashion brands. Buy less but buy better. Make soups, smoothies or stewed fruit to use up produce coming to the end of their life. Increase my consumption of plants (fruit and vegetables) and investigate more sustainable options for meat/fish. I’m definitely at the beginning of my sustainability journey but I hope to become more educated and savvy in 2019. No doubt I’ll pick up plenty of hacks along the way which I’ll try to share. If you have any tips, I’d love to hear. I can’t believe it has taken me so long to write this blog. The last year has just whizzed by in the blink of an eye. I had thought I had already written and posted this blog until somebody got in touch to ask if I could write about my post-operative experience. If you haven’t read about my bowel resection surgery you can do so here. So here goes…. I hope I remember most of it and I don’t leave out anything important. I left the hospital a week after the operation. I remember my then fiancée (now husband) collected me and we drove home very slowly. I was still very tender from the operation and every bump in the road hurt a lot. I had a pillow between myself and the seat belt to cushion myself but it still hurt. The journey home tired me out and I was only good for laying on the couch for the rest of the day / evening. It was strange going back to my own bed and lying down flat after a week of an adjustable hospital bed which had me propped up. I had to sleep on my back as it was too sore to sleep on my side. I remember not having the greatest of sleeps for the first while when I went home as it was uncomfortable and sore. It was hard to shower and dress myself at first. My shower is in a bath so even getting my legs over the side of the bath was a bit of an ordeal. I had to also be mindful of my wound and dressing. Basically, everything took way longer to do and was sore. But I was able to do everything for myself and didn’t need assistance from my fiancée. The day after I left hospital my sister came to visit and brought me to the supermarket, so I could stock up on groceries. I was able to walk around and even carried a basket of items. I probably shouldn’t have as it ended up being heavier than expected but I managed it fine. We walked around the shopping centre for an hour or so. I was wary of people coming too close in case they bumped against my wound or I needed to move quickly to get out of their way. I wasn’t able to make any fast movements. Needless to say, I was bunched after the outing. That was possibly the only day that I went back to bed for a nap. For the first week or so I felt tired after too much exertion and would need to go to bed early but for the most part I would just take it easy on the couch rather than napping in bed. The only things I could wear for a few weeks were a pair of old jeans and tracksuit bottoms that were loose around my belly button where my wound was. It was very sore to laugh for the first while also which was hard as my husband and I are always joking around and he makes me laugh a LOT. Food wise I kept it very simple – broth, homemade jelly, well-cooked meat, fish and vegetables, stewed fruit, ripe banana, coconut yogurt and some gluten free toast. But as the weeks passed, I was able to increase the variety of foods I was able to introduce. I got out for a walk/walks every day. I’m an active person so being indoors all day would have driven me mad. I started off very slow but as the days and weeks went by my pace increased. I started off with maybe a 15 minute walk from the apartment, then 20 minutes, then 30 minutes and then up to 45 minutes by which time I was ready to drive again (about four weeks after the operation) and could drive to the local park for a walk there. I started back at yoga around that time too. Obviously I took it very easy to begin with which was difficult enough for me as I have been doing a yoga-based class for about 15 years but it was a practice in listening to my body and being gentle with myself. I remember reading a lot of blogs before the operation with people saying they got through so many box sets and movies while they were at home recuperating. I just about got through the first season of The Crown. That first week at home mainly consisted of visitors calling by and studying. I sat an exam a week after coming home (two weeks after the operation, I know…. Crazy!!!) and then once my exam was out of the way I got stuck into wedding planning, cleaning the apartment, going for walks etc. The days actually flew by. I started working from home at around four weeks and went back to work early (five weeks after the operation). I was still tender at that stage but felt I was able for public transport and sitting in an office all day. The first couple of weeks back to a ‘normal’ routine were definitely tiring. I had to go back to the dressing clinic twice during the first weeks as my wound wasn’t healing very quickly but it eventually started to dry up and heal. I wasn’t as sore. I started to put on some weight and could eat a greater variety of foods. I didn’t get bloated anymore which was amazing. I got married nearly six months to the day after my operation and to be honest having the surgery when I did was the best thing I could have done. I honestly wouldn’t have been able to enjoy my wedding and my amazing three-week honeymoon in Italy if I hadn’t had it done. There’s absolutely nothing I would have changed about my surgery experience. I’m lucky, it wasn’t as bad as I thought it would be and I had a positive experience and my recovery was a lot quicker than expected which I put down to diet, lifestyle and self-care. 20 months on, I’m still medication free and for the most part feeling good. In comparison to before the surgery it is night and day. My CRP (inflammatory marker) is down, I hardly ever get bloating, the intestinal gurgling I had before is non-existent, my energy levels are much better (although there’s always room for improvement), I’ve put on weight and the scope of foods I can now have is much wider than before. The scarring is minimal – I’ve even gotten a belly button of sorts back! Is everything perfect? Not quite. I still have some bowel issues from time to time, my hormones aren’t as balanced as I’d like them to be (periods are still ad hoc) and my mood isn’t as bright as I’d like it to be (which I put down to hormonal imbalances). So… I’m still a work in progress 😊. But I realise it’s a journey and I love continually learning more about health and applying new things to myself. Do I wish I had the surgery sooner? Not really. Knowing me, I think I needed to get to a place where I couldn’t go on the way I was so that I was 100% ready. I tried every other avenue and had to come to terms with the fact that sometimes surgery can indeed be lifesaving and I didn’t need to feel like a failure as I couldn’t ‘fix’ myself just with diet, lifestyle and alternative therapies. My disease had left such a mark despite being in remission (thanks to cold structuring). I firmly believe that not only was surgery life-saving, it also gave me back my quality of life. I’m now a qualified Nutritional Therapist and am looking forward supporting people on their health journeys. When people think of Italy one of the first things they probably think of (after Rome, Venice, Florence etc) is the food. 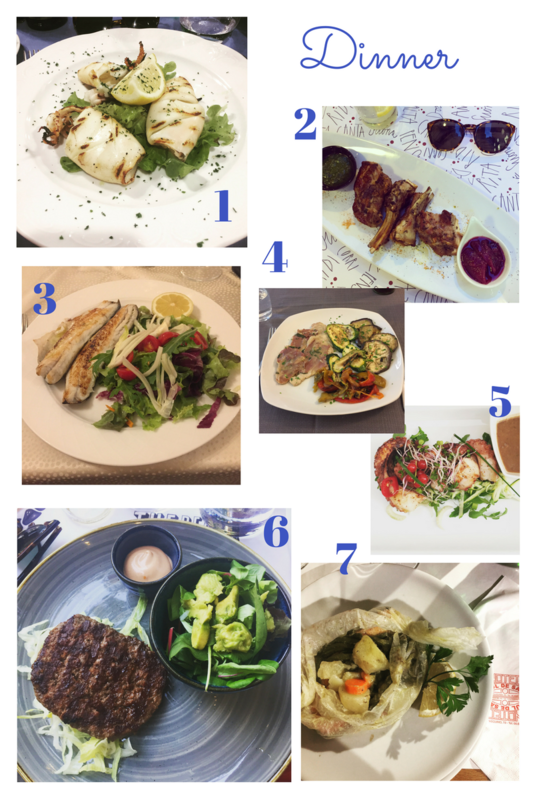 If you are like me and have to be mindful of what you eat (especially gluten and dairy) you might be a bit apprehensive about travelling to and eating out in Italy – oh hello there pizza, pasta and gelato! Normally when I travel I like to stay somewhere with a kitchen so that I can cook at least one or two meals a day. So I was a little nervous myself about my three week honeymoon as we were going to be staying in hotels (not a kitchen in sight). But travelling around Italy was a lifelong dream trip and I was determined to make it work. And do you know what? It wasn’t too difficult navigating my dietary restrictions. We stayed in three places – Malcesine in Lake Garda, Rome and then Sorrento. We were lucky in that a buffet breakfast was provided in each hotel. The breakfast in Malcesine (Hotel Castello) was nothing short of amazing. Along with the usual breakfast fare (cereals, breads, cakes, crepes which I don’t eat) they also had fresh fruit, eggs of different types (hard-boiled, scrambled, omelettes, fried), salad, a wide range of deli meats and even prawns! They had a great variety of individually packaged gluten free products such as breads, biscotti, breadsticks, museli and freshly made cake too. One of the breads on offer was not only gluten-free but also dairy and egg free too! While I normally steer clear of gluten free products for the most part as they’re usually quite processed I did have some of the gluten free/dairy free bread and I was impressed! While the buffet breakfast in the hotel in Sorrento was pretty similar but not quite as good (the gluten free offering consisted of white bread and biscuits), the breakfast in the hotel in Rome wasn’t great (tinned fruit yikes!). Luckily there was a health food shop NaturaSi just up the road from the hotel there where I was able to pick up organic fruit, coconut yogurt, coconut milk and some on-the-go snacks. As we had a mini fridge in our room I could leave the yogurt and milk in there which was handy. There are a number of these health food stores around Rome so if you are looking for one, they’re a great option. I didn’t come across any health food shops in Lake Garda or Sorrento but the supermarkets had a wide variety of fresh produce, gluten free products and milk alternatives such as almond, rice and coconut. There was a pharmacy in the main square in Sorrento (Farmacia Farfalla) that actually had a free-from section full of gluten-free, dairy-free, and sugar-free products and healthy snacks so I managed to pick up a few things there too. For the most part, lunch usually consisted of salads – either in a café or bought from the local supermarket. Most places offered sandwiches or pizza’s for lunch and a small range of salads but a lot of these weren’t both gluten AND dairy free so I actually found lunches the most difficult meal. I found the safest options when eating out were tuna salads with minor modifications or prosciutto and melon. I was surprised that chicken salads weren’t offered on a lot of menus, however I found a lovely place in Malcesine (Osteria Santo Cielo) that had a delicious grilled chicken and orange salad. My own salads from the supermarkets usually consisted of a bowl of leaves, cucumber, olives and olive oil with prosciutto or tinned sardines or mackerel. And on days when we were out and about, I’d have snacks on hand like fruit and some fruit and coconut bars or I’d pop into a deli and get some fresh slices of prosciutto. Gelateria Cristallo in Riva had a wide selection of gluten free pizzas, pastas and sandwiches as well as vegetarian and vegan options and green juices and smoothies. Eating dinner out gluten and dairy free was actually fine. A lot of restaurants had allergen menu’s and the waiting staff usually had very good English. I’m a meat/fish and two veg kinda girl anyway so I usually chose the grilled fish or meat (fried may have posed a problem as they tend to coat stuff in flour) with a side of grilled vegetables or mixed salad. But I ALWAYS said to the waiting staff that I was gluten and dairy intolerant. I used “senza gluten and senza lattosio” a lot in case they didn’t understand my English fully!! I’ve been stung too many times with a menu that doesn’t explain properly what’s in a dish. Most restaurants had a very very similar menu with the same dishes on it – antipasti, first course (pasta), second course (meat/fish), pizza, side dishes and desserts and you can pick and choose what you want (i.e. you don’t have to order a first AND second course). Finding gluten free pizza and pasta was easy as most restaurants offered it. What I found hard was getting gluten free pizza or pasta which was dairy free and also tomato free so I usually didn’t go for this option and stuck with my fish/meat and veg. But I wanted to try pasta while in Italy so when I saw a restaurant in Sorrento that advertised themselves as gluten free on their signage I thought that it might be the place. They said they made their own gluten free pasta in the restaurant and I found a dairy-free and tomato-free option on the menu (lemon, basil and green olive) so went with that. It was an EPIC fail! The sauce was gloopy and oily and it didn’t look appetising at all. I ate about a quarter of it and decided to leave it. Unfortunately I was pretty sick the next day. I’d like to think it was the sauce that didn’t agree with me but I didn’t chance any other gluten free pasta dishes on my trip. Restaurant La Pace and Osteria Al Vecchio (5) where I had the grilled octupus. Bar Pizzeria Da Pedro (I had grilled swordfish and polenta). Brillo (2) near the Spanish Steps – A cool restaurant just off the shopping street. I had lamb chops with a red onion marmalade – delicious. TED Lobster and Burgers (6) in Prati near the Vatican – When we were craving something other than Italian food. I had a burger on leaves with salad. Cul Du Sac (7) near Piazza Navona – A real traditional Italian restaurant where I had salmon and veg cooked in paper. Worth the wait. La Soffitta Renovatio (4) in Prati district – I had veal covered in prosciutto and sage which I’m definitely going to try to replicate at home as it was so so tasty. Ristorante L’Abate (1) just off the main square – I had grilled squid which was lovely but the boiled veg was boiled within an inch of its life! Ristorante O’Murzill. Gorgeous tiny little restaurant with the red and white checkered table cloths and great customer service. We liked it so much we went twice. Once I had the lamb chops and the second time I had grilled fish. But what I liked most was the grilled vegetables which were done to perfection with a hint of herbs and garlic. So so good!! Restaurant Da Gigino (3). Another place we went to twice. They made their own gluten free rolls which were still hot when they came to me. I had roast chicken one time and then grilled fish and salad the next. The restaurant has its own cookbook and I can see why. Le Grazie. Probably the best grilled salmon I had on the whole trip. Crispy but not dry. Ristorante O’Parrucchiano. We ate out on the terrace under the lemon trees and fairy lights. Super pretty. I opted for lamb and broccoli florets. I preferred the romantic atmosphere to the food but it wasn’t bad. Cento Per Cento in Malcesine right beside the Castle. They had vegan offerings too and stayed open until 11pm. In Rome, Wonderful Ice Cream (2) was great and Grom in Verona was amazing. Grom have outlets all around Italy and actually internationally too. They have a great menu for those with intolerances. I got the blueberry sorbet in there and it felt like I was just eating frozen blueberries – so good! 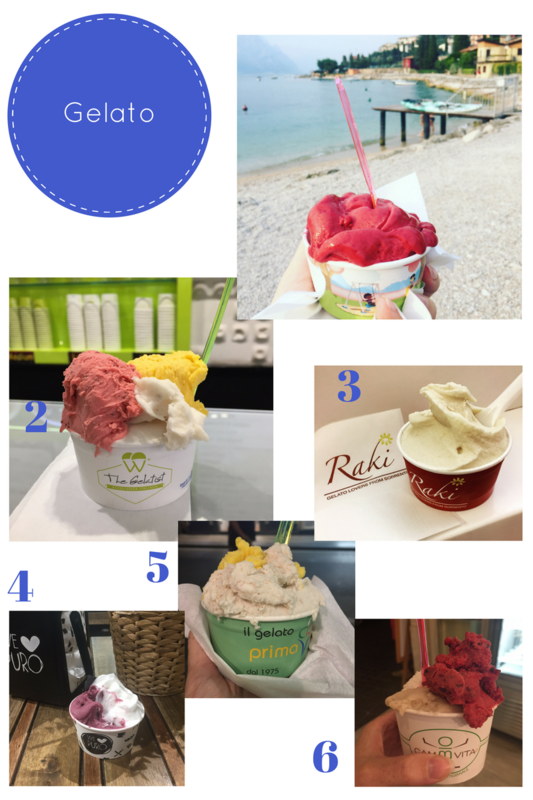 In Sorrento I loved Raki (3) which is award-winning and I can see why, Gelateria Primavera (5) which had an amazing selection and We Love Puro (4). So eating out in Italy was much easier than I expected. While I relaxed some of my normal restrictions and ate some foods that I wouldn’t eat much of at home (such as nightshade vegetables, nuts, gluten free products and dairy free gelato etc.) I still was able to stick to gluten free and dairy free with relative ease. I learnt that I can probably tolerate some foods much better than before and that it could be more of a case of having a tolerance threshold now (can have some but not a lot). I’m so glad I had my Crohn’s surgery when I did as I don’t think I would have enjoyed my honeymoon as much!!! It’s been a pretty busy (and somewhat stressful) few months for me with getting over major surgery, working full time, studying part-time, doing exams and planning a wedding! I’m a stresser/worrier by nature anyway so having everything come at once has been at times overwhelming. But I know that stress can be inflammatory and I didn’t want to encourage a Crohn’s flare especially with my wedding and honeymoon coming up so I needed to be extra proactive in managing stress over the last few months. I thought I’d share some tips that have been helping me handle this busy time and hopefully keeping stress at bay. I’ve had to learn to prioritise what’s most important at a particular moment in time and realise that usually something’s gotta give. For me certain things needed to take a back seat over the last while like this blog and social media. 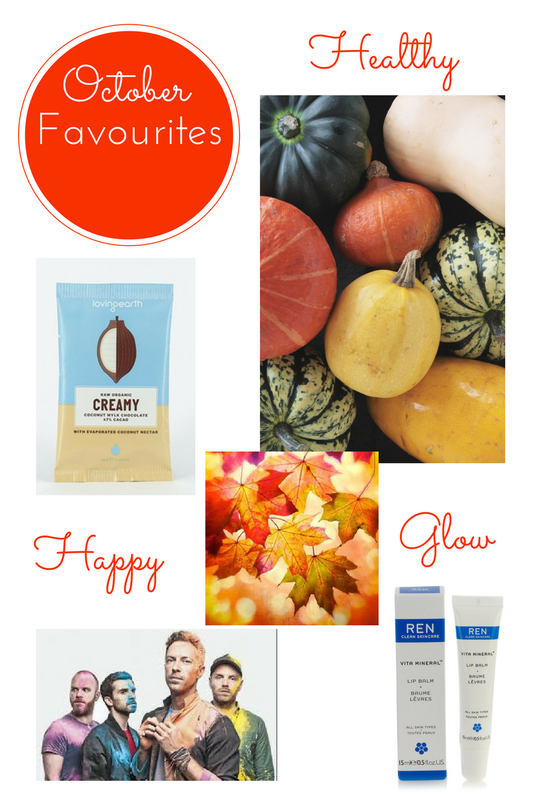 Which brings me on to…. I’ve had to accept the fact that I can’t do everything (which has been hard). I’ve had to let go of thoughts of managing everything myself and that it’s alright to leave some things to the side and to also delegate. A problem shared is a problem halved. Rather than bottling stuff up, I made sure to talk about any stresses and worries. I’ve been going to talk therapy for a number of years and it’s times like these that I really appreciate it and see the benefit. Sleep has been a huge priority for me. I can handle so much more after a decent night’s sleep so I’ve been adopting good sleep hygiene practices – consistent bed time routine, no devices, using amber glasses to read, keeping the room cool, breathing exercises etc etc. Stress can deplete the body of many nutrients so I’ve been conscious of eating a wide variety of nutritious food (especially colourful fruits and vegetables for the extra vitamin and mineral hit). I’ve also been making sure to include plenty of anti-inflammatory foods every day (like ginger, turmeric, oily fish, green tea). To boost my nutrition, I’ve been taking a good quality multi-vitamin, Vitamin D, a good quality pro-biotic for digestive health and a mix of B vitamins and magnesium to help my nervous system. I’ve made sure to get exercise every day that I can. And since it’s summer I’ve tried to get outside as much as possible. Exercise like walking and yoga really relieve stress for me and the added sunshine and fresh air boost my mood. While I would love to say I’ve meditated every day I have to confess that I just haven’t built in a practice into my daily routine. However, I make sure to stop at moments throughout the day and check in to how I’m doing – am I holding tension anywhere? is my mind racing? – and take a moment or two to get present and breathe a few deep breaths and tell myself everything is figureoutable. I’ve made a point of meeting up with friends and NOT talking about what’s going on with me but listening to what’s going on with them. I found it has given me a little perspective. It can be very easy to get caught up inside my own bubble where I’m ruminating on to-do lists etc. It’s good to know that there’s life outside wedding planning, exams and Crohn’s. I’ve also tried to make sure myself and fiancée take a break at the weekend – whether it’s a date night, a long walk or brunch – we make sure to do something nice to get out and about and leave the wedding planning behind. I don’t think any of these tips are reinventing the wheel but they’ve been helping me and you may find them of help if you are going through a busy / stressful period yourself. If you’ve any tips yourself I’d love to hear them. Wow, it’s been a while since I wrote a post and a lot has happened in the last few months including bowel resection surgery for my Crohn’s. I wanted to do a post about why I chose to have the surgery as it definitely wasn’t an easy decision to make. Last year I wrote about meeting with a surgeon in early 2016 who wanted to take out over 30cm of my ileum including the ileocecal valve and then do stricture-plasty in about five other places. This came as a shock as I always thought I had a mild case of Crohn’s and that eventually the inflammation and disease would go away once I got the diet and lifestyle stuff figured out. But even though I had been doing everything ‘right’, the scar tissue from previous flares and inflammation had gotten worse. What I was most concerned about was the removal of the ileocecal valve. It’s a valve between the small and large intestine that makes sure there’s no back flow from the large intestine into the small amongst other things. This can lead to SIBO (there’s nothing to keep bacteria out of the small intestine) and chronic diarrhoea. In a bid to avoid surgery I underwent Clear Passage therapy (read about my experiences here and here) but unfortunately it didn’t have the outcome I wanted and flash forward to January this year when I found myself sitting in front of a surgeon again (this time a different one to get a second opinion) who basically told me the same story as the previous surgeon had the year before. This time I was more prepared for the conversation and basically my symptoms had gotten to the stage where I couldn’t ignore them anymore. The scope of foods that I could eat without causing bloating, distention and fermentation had whittled down to basically nothing – well cooked meats, fish and low residue veggies and green juices. Fruits had become a no-go area (apart from maybe half a very ripe banana) as had raw vegetables. I was worried about most meals but eating out or at family events had become nearly impossible. I remember heading home early from a Christmas dinner out with my friends and having the worst bloating and pains. Another time I went to my in-law’s for Sunday dinner and I just sipped on warm water while everybody else tucked into their roast. I lied and said that I had met a friend for a late lunch but really I just didn’t want to risk eating anything I hadn’t prepared myself. I missed out on a trip to New York as I was afraid that flying would put pressure on my intestines and they’d perforate. I used to bring a hot water bottle or hot pack into work and college to easy my tummy pains when I was distended or experiencing spasms. The effects of the internal scarring was so bad that I actually couldn’t even drink a cup of tea without hearing and feeling the liquid gurgling its way through my system. What really sealed the deal for me was going to see my wedding band one evening doing a show-case and being doubled-over with stomach pains. I just thought to myself that I didn’t want to feel this bad on my wedding day and that life shouldn’t be this miserable. While it was a very tough decision to make and some part of me felt like a bit of a failure (surely I should have been able to ‘fix’ myself through diet and lifestyle), I felt that I had given the natural route the best shot – diet, lifestyle, Clear Passage therapy – and I was ready for surgery. I had a good rapport with the new surgeon and while nervous about what was to come I felt it was worth the risk as I couldn’t continue living life as I was. In my next post I’ll discuss my experience of the surgery and what life is like now! 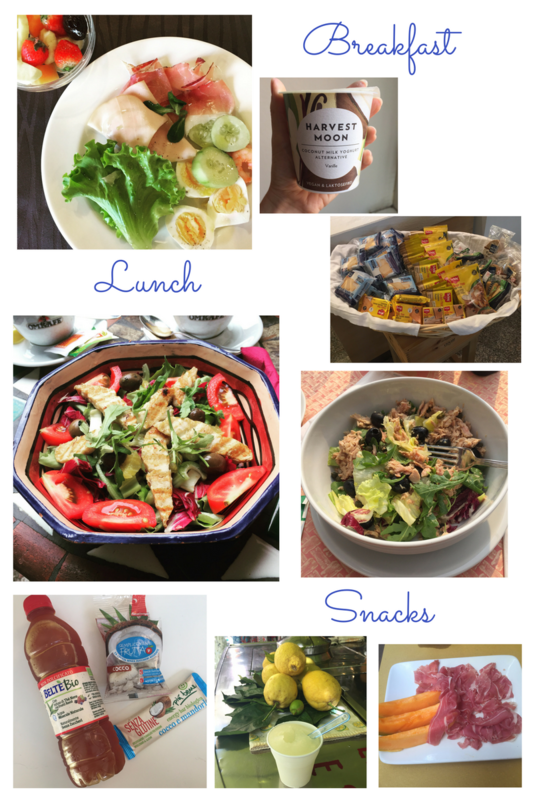 I went to Clear Passage with a number of issues – strictures from Crohn’s, lack of periods, low nutritional absorption, SIBO, fatigue, leg ache etc. My main reason for going though was to avoid major surgery for strictures. Now that the therapy is over and I’ve been doing the home programme for about six months, I thought it would be good to do an update. The support before, during and since treatment has been amazing!!!! Seriously, these people care! Anytime I’ve had any questions or haven’t been well I can email and they get back to me within a day or two. That has really blown me away. I got my period back!!! After 18 months of not having one naturally. While they aren’t like clockwork and it’s great to know I can have them back naturally. I used to have achy legs all the time (especially in the morning – my knees used to really ache) but I haven’t experienced that since the treatment. I learnt so much about my posture and how everything was connected – so trouble with my hips / glutes etc stemmed from the adhesions in my abdomen etc. I got a home programme so I continue to do therapy on myself every day which I find very useful. The treatment is very very individualised – I have a feeling no two treatments are the same. My blood work shows slight improvement in absorption of nutrients so I’m heading in the right direction. While I’m still low in certain nutrients and still am fatigued sometimes, it doesn’t seem to be as bad as before the treatment. The treatment experience itself was really good. I enjoyed the week. I definitely felt very different after the week – I could feel everything inside move with more ease and less rigidity. My flexibility has improved also. What I liked about Clear Passage is that they are very research orientated. They want to put together scientific research papers together to validate their work. Any staff member I came in contact with was lovely. They are super picky about the therapists they head hunt and the training that the therapists go through. With regards SIBO, they have been given the thumbs up from Alison Sebecker (siboinfo.com) and others like her. I found that I experienced more gas bubbles, tummy gurgles, fermenty-feeling and a strange feeling whenever my bladder gets full. They feel this could be due to hormonal shifts or a candida infection or both. But it turns out that this could be due to dilation of my intestines and a resulting back-up of its contents. I wanted to be able to increase the foods I was able to eat without adverse reaction and unfortunately due to this gas/bloating etc my scope has gotten narrower which gets me down a little. And as for avoiding surgery? While my latest MRI scan showed significant improvements in some areas of stricturing, unfortunately there is an area that has gotten worse and I’m still at high risk of a perforation. So while Clear Passage was a positive experience, it didn’t have the particular outcome that I wanted and I’m now facing surgery. More on this in my next blog. 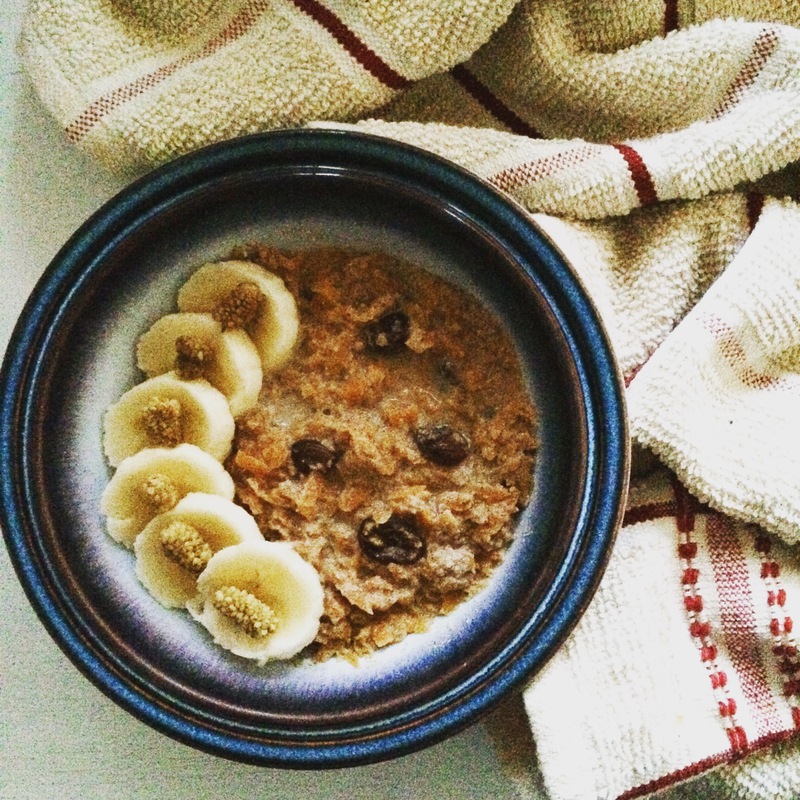 Normally I have meat or fish and veggies for breakfast these days but with the change of season I found myself craving warming oaty porridge. I used to love porridge and could easily have had it morning, noon and night (I kid you not!!) with lashings of milk and spoons of sugar (I was a divil for the sugar)! Flash forward a few years and thanks to a Crohn’s disease diagnosis and many food intolerances, I find myself with a grain-free and dairy-free diet. Not one to be deterred by a minor detail like this I tried to come up with a porridge of sorts that would still give me the warm comforting feeling of porridge but with none of the bloating side-effects. Using ingredients that I tolerate I played around with this carrot cake porridge which was extremely easy to throw together in the slow cooker and turned out pretty well. 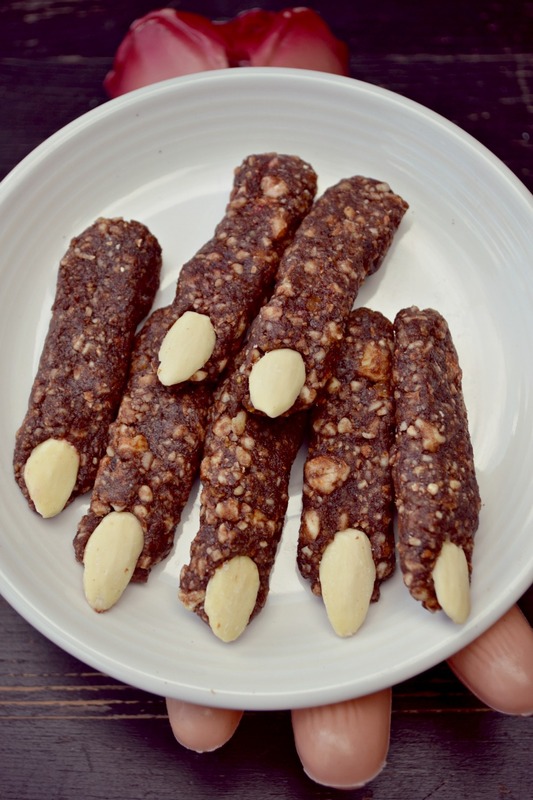 It’s paleo and vegan and nut free too (if you want). Grate the carrots and add them to the slow cooker. Add the rest of the ingredients and stir until all mixed through. Make sure that all the ingredients are covered with the coconut milk (adding more if needed). Cook on high for an hour or two or low for four to six hours until the carrot is cooked and soft. Serve up with toppings such as chopped banana and mulberries or really what you like! Halloween has changed a lot since I was a kid. Back in the day everybody made their own costumes (normally from a black plastic sack), there were no decorations, you asked neighbours to ‘help the Halloween party’ rather than saying ‘trick or treat’ and you usually came back from doing the rounds with a bag full of apples, nuts, mandarins and only if you were really lucky did you get raisins or homemade popcorn. Sweets were the Holy Grail and it was only the rare house that would be giving any out. Needless to say, as word got around that there was a house giving away sweets all the kids of the neighbourhood descended on the house meaning they were cleaned out pretty quickly. When you got home from going around the neighbourhood you had to have the nut cracker ready to break open the hazelnuts and walnuts and your fingers would be sore from pinching monkey nuts opens. Come to think of it, it was hard work! Fast forward twenty (ahem! )-odd years and it’s a different ball game. Costumes are sold everywhere, houses are decorated with ghosts, cobwebs and carved pumpkins and kids come home with treat bags brimming with fun-sized chocolate bars or bags of sweets. With childhood obesity here in Ireland rapidly on the increase, we have to look at holidays such as Halloween and think of ways they can still be fun for kids without them revolving around all the crap sugar laden ‘treats’. 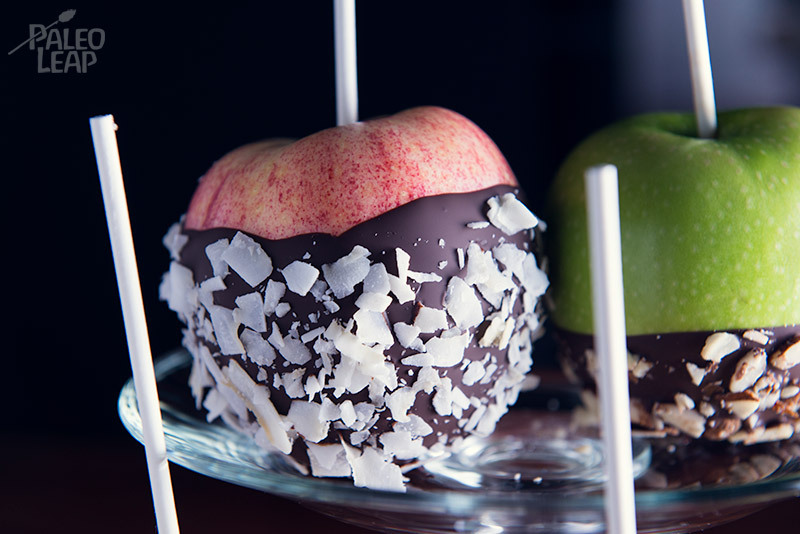 Instead of toffee apples, why not try dark chocolate dipped apples? 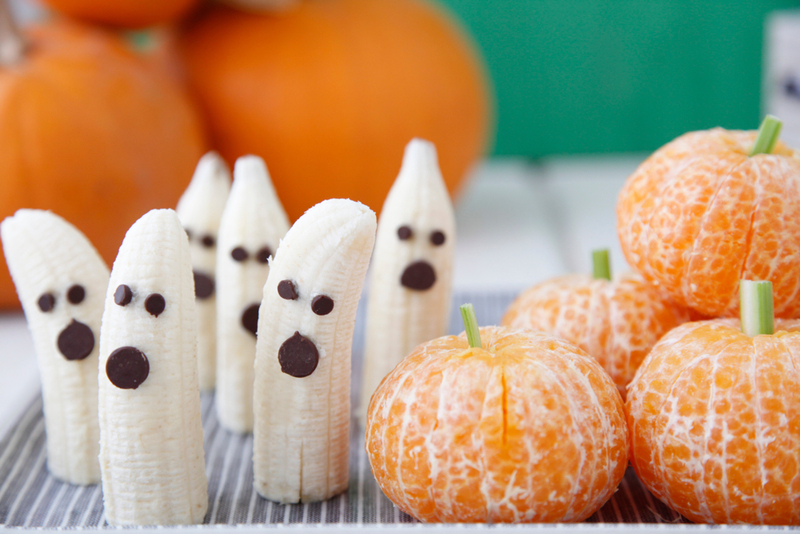 These tangerine pumpkins and banana ghosts look so cute and ridiculously easy! While I don’t have kids myself, I think I may just give these a try anyway!! 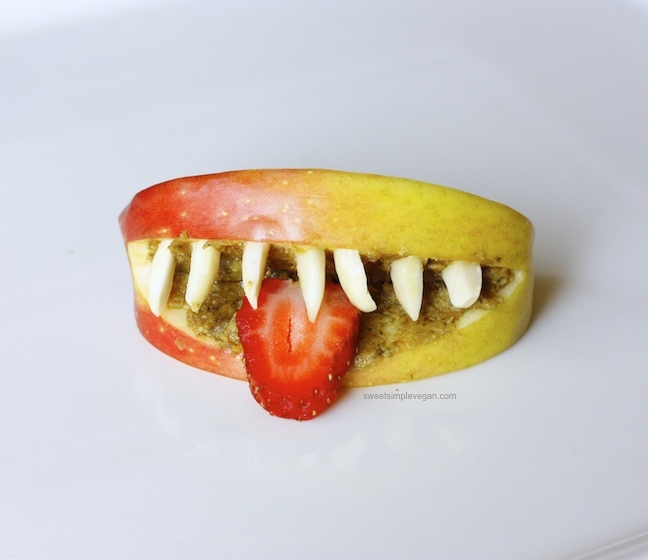 I’d love to hear your thoughts and suggestions on healthy Halloween treats and recipes.